Police say a second suspect has been arrested and a gun has been recovered near the scene of a Los Angeles shooting that wounded a high school student and a school employee. Officials say the victims — a teenage boy and a woman — were shot Thursday at a Jack in the Box restaurant across the street from a charter school. Both have extremity wounds and are hospitalized in stable condition. Investigators don’t know yet if they were targeted. A man was arrested shortly after the gunfire erupted. Authorities say a second male suspect was taken into custody hours later. There are no outstanding suspects. The school in a business district in LA’s Van Nuys neighborhood was put on lockdown during the search. Los Angeles police say a shooting near a charter high school wounded a male student and a female school employee. Sgt. Barry Montgomery said he doesn’t know yet if the victims were targeted in the shooting Thursday at a Jack in the Box restaurant across a street from the school. Fire Department Deputy Chief Trevor Richmond says both victims have extremity wounds and were transported to a hospital in stable condition. Montgomery says a male suspect age 18 to 20 is in custody and officers are searching for another with the same description. Officers appear to be focusing on an apartment building behind the fast-food restaurant. Montgomery says the school in a business district in LA’s Van Nuys neighborhood was put on lockdown due to the proximity of the gunfire. Police have arrested one man and are searching for a second male suspect in a shooting that wounded two people across the street from a Los Angeles charter school. Officer Ray Brown says CHAMPS Charter High remains locked down more than an hour after gunfire erupted at a nearby Jack in the Box restaurant Thursday. Officers with guns drawn searched the area in a business district of the Van Nuys neighborhood. Brown says two victims are hospitalized in unknown condition. He did not have additional information about the suspect in custody. Los Angeles police say a shooting that wounded two people did not occur at a school but at a fast food restaurant across the street. Officer Ray Brown says two male suspects ran after the shooting just after 12 p.m. at a Jack in the Box in a business district of the Van Nuys neighborhood. CHAMPS Charter High School was locked down as police combed the area. TV news footage showed two people sitting up on gurneys being wheeled into ambulances. Police say two people were shot near a Los Angeles charter school in a business district. Officer Rosario Herrera says police responded to a call Thursday in the Van Nuys area. Officer Ray Brown says there were two female victims in unknown condition and police are searching for two male suspects. 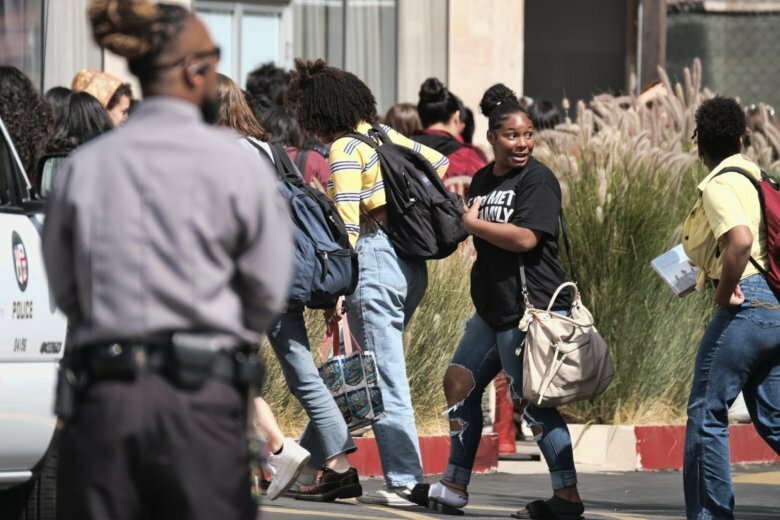 Police swarmed the area near the CHAMPS Charter High School of the Arts about 15 miles (24 kilometers) northwest of downtown Los Angeles.